He's a maverick both courtside and in the political arena. NBA owner and billionaire investor Mark Cuban said he's open to a conversation about running for Vice President in 2016 with either Donald Trump or Hillary Clinton. But Cuban, who describes himself as "fiercely independent", does have a few caveats. In an interview with NBC's "Meet the Press," Cuban said, "If [Trump] asked me, I'd be like, 'Okay, Donald. That's great. Let's talk about it. But we're both going to have to dig in and really look and understand the issues so we can come up with solutions.'" In a portion of the interview released Friday, Cuban also expressed interest in running with Hillary Clinton. He said he would "absolutely" entertain that conversation, but "she would have to go more to the center." Clinton, in a separate interview on "Meet the Press," did not fully dismiss the idea. "I appreciate his openness to it," she said. In vetting vice presidential candidates, Clinton explained, "I think we should look widely and broadly. It's not just people in elective office. It is successful business-people." Apparently hitting Donald Trump, she continued, "Successful business-people who are really successful, as opposed to pretend successful, I think have a lot to offer." Earlier in the week, Cuban's name was floated as a potential third party candidate being recruited to take on Donald Trump. 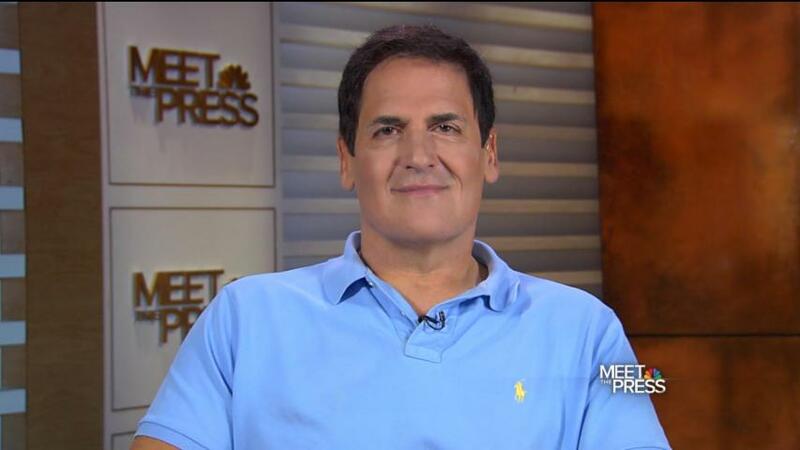 Cuban declined, telling MSNBC's Steve Kornacki, "there's not enough time, and it just wouldn't work." Looking ahead to a potential 2020 or 2024 run for president, Cuban candidly replied, "It's too early to tell...There are so many variables that I don't have the answers to." The tech entrepreneur did admit Donald Trump has "opened the door to non-traditional candidates, which is a great thing." Cuban says he's more open to running for public office now because "You don't have to be the perfect Stepford candidate like you would've been in the past." Cuban said he believes Trump "has a real chance to win, and that's scary to a lot of people." What alarms him specifically is that Trump is "listening to everybody, which is fine on the surface," but, he continued, "It's coming across as if he's proposing things based off the last person he talks to." On concerns about Trump's temperament, he conceded that "It's possible for anybody to change, but I just don't see evidence that he wants to change." Cuban concluded, "I think he's trying to do what he thinks is the right thing, right now. But there's just so much coming at him at once, he's looking for shortcuts. And this is just not a job where there are shortcuts."